Whether it's for working from home, doing some admin tasks or a creating a space for children to do their homework, more and more of us are looking to incorporate a study area into our homes. However, sometimes we don't have space to have a dedicated room that can simply be turned into a home office and end up cramming a desk and all of our office gadgets into a corner of a living room or bedroom. It doesn't have to be this way! 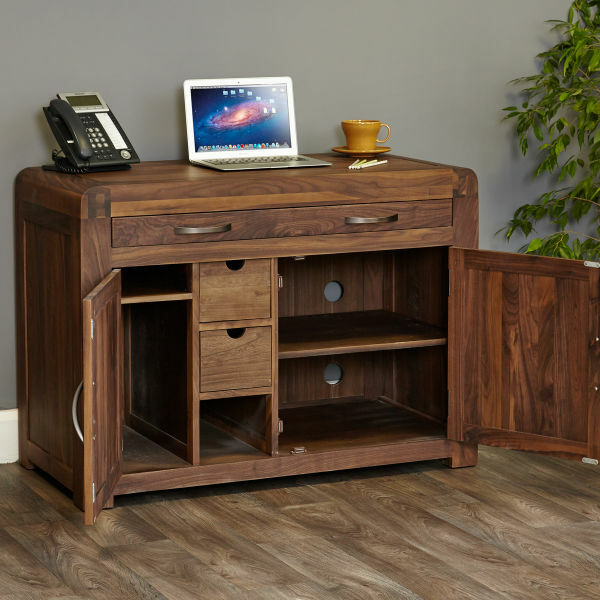 Here at The Wooden Furniture Store we stock a range of hide away office desks so that you can live and work in the same space. Our designs have been carefully planned and thought through so that almost any space can be turned into a useful home working space with one of our clever hidden desks. We have designs to suit your personal and interior style and many of our collections are a part of larger home office ranges that include bookcases, filing cabinets, printer cupboards and wall racks (if you have the extra space!). Hideaway computer desks enable you to easily create office of study space within your home. When not in use they look like a small sideboard, making them great for use in the dining room or kitchen your home. At the end of the working day, just pack away your computer and office equipment and relax in your space. Our hidden home office desks feature a contemporary design that blends style and functionality with maximum storage. The clever, hidden storage behind the two doors includes plenty of cupboard space, adjustable and removable shelving (as well as a slide-out shelf that conceals a printer or scanner), two stationary drawers plus an extendable shelf to give extra work surface space that can be used as a writing desk or for a laptop. Not bad for a desk that's only 80cm high, 108.5cm wide and 55cm deep! A concealed office desk will give you a dedicated area to make working, studying or just taking care of paperwork a little easier. Perfectly proportioned, our designs look equally at home in a country cottage or modern townhouse. As specialists in solid wood furniture our collection of compact home desks are available in oak, walnut and mahogany. Small but perfectly formed, our hideaway oak desks create a clean and contemporary feel to your space and blend perfectly with other wood types. 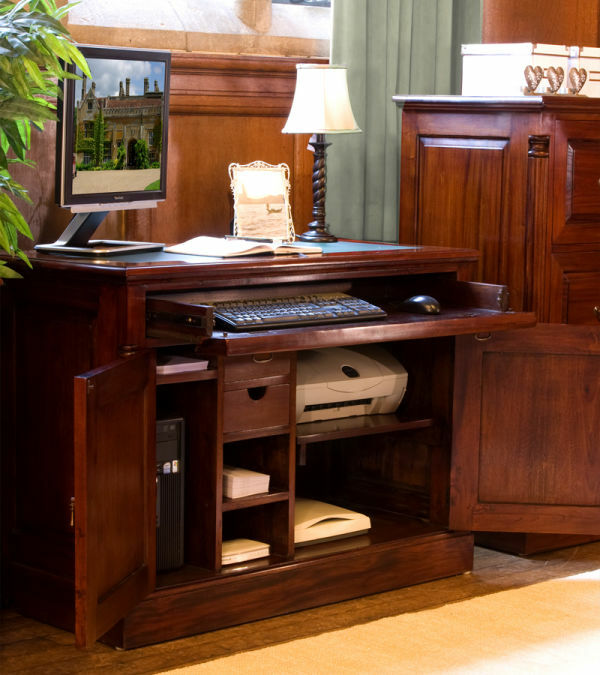 A mahogany hidden home office adds a sophisticated, traditional touch and is made from high quality timber with a stunning finish. For something a bit more modern, our solid walnut desks bring style to a room with their distinctive grain marking and beautiful detailing. 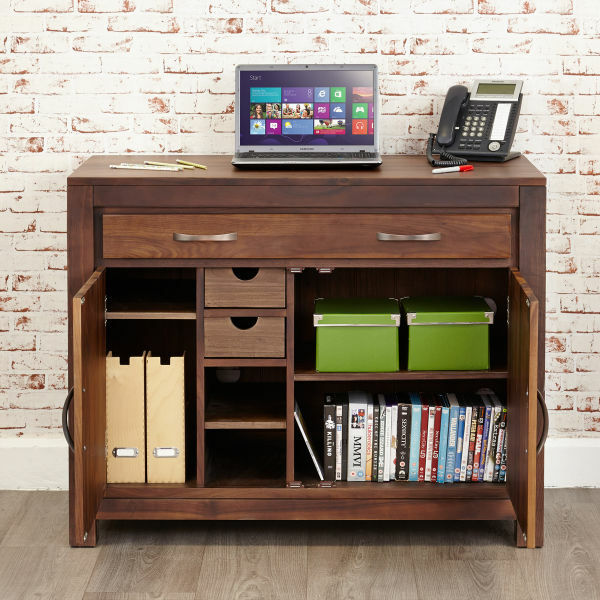 All of our clever space saving hidden home office desks offer exceptional craftsmanship and are made from solid wood. All the drawers are made with dovetail joints and pre-drilled cable holes keep all of those messy cables tidied away out of sight. Each desk is treated with a durable varnish to enhance the timber grain and protect against everyday wear and tear and are finished with elegant fittings to ensure that they look perfect - as good as the day they were purchased - in years to come. Orders are delivered free to most postcodes and all desks arrive fully assembled, direct to your door delivered by our considerate logistics teams. 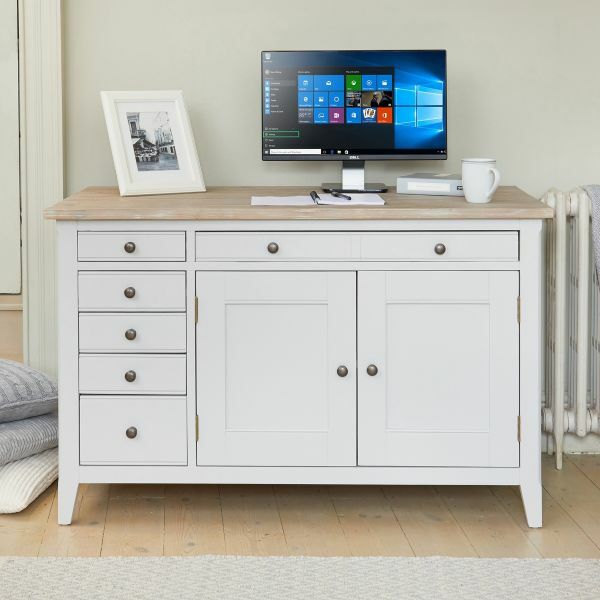 Packed with clever features and beautiful detailing a hidden home office purchased from The Wooden Furniture Store is an investment for years to come; all of our furniture is of the highest quality, with many ranges guaranteed for five years. So shop our compact home office desks to create a work space packed with clever features, beautiful detailing with enough space to keep you organised, efficient and of course, tidy.